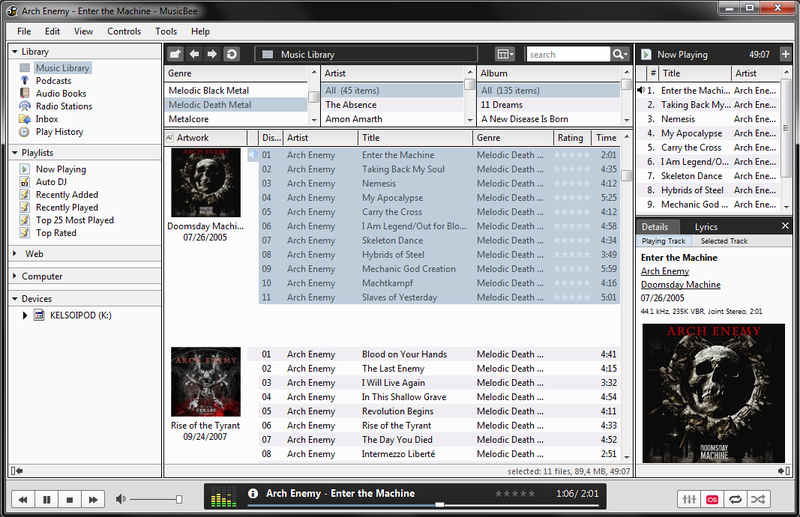 Today I decided to test MusicBee’s Auto-DJ feature. I have to admit that it seems rather interesting. 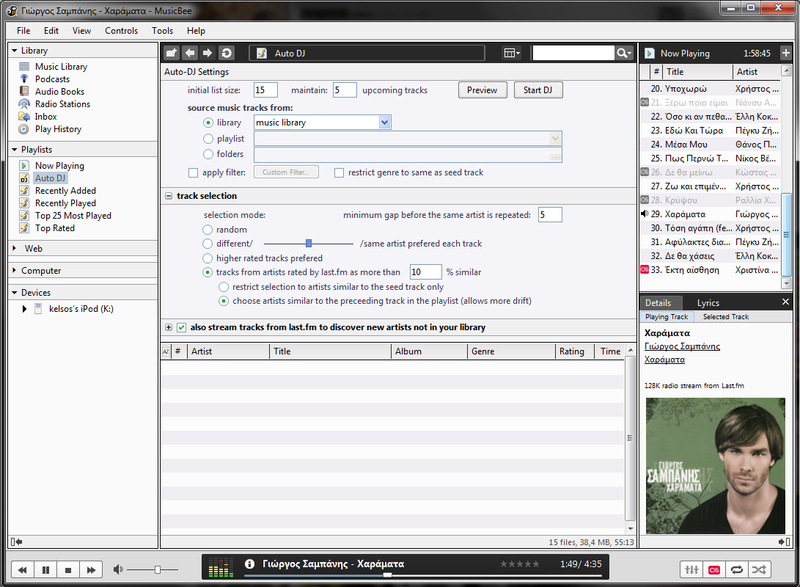 The feature creates random playlists based on a seed track. You can choose the initial list size, the maintain X upcoming tracks feature will keep X non-listened tracks in the list. After you listen to some tracks and the remain tracks get lower than X, the feature will automatically add more tracks to the playlist to maintain the X. You can choose as a source for the tracks your entire music library, or some specific playlist or even some folders. You can also apply some custom filters to restrict the choices. You also have the option to restrict the track genre to the the same as the seed track. Now on the track selection you have a random option, and a choice of different/same artist with a slide bar that goes from different to same artist. If you are towards different it will choose more tracks from different artists, and if you go towards same it will choose more tracks for the same artist depending on the position of the slider. Another choice is the higher rated tracks preferred. Another really cool option is getting tracks from last.fm. With this option you can get tracks from artists rated by last.fm as more than a percentage (that you can change) similar. It also has two sub-options, the one is to restrict the selection to artists similar to the seed track artist only, and the other is to choose artists similar to the preceding track in the playlist (this one allows more drift to the playlist generated). The feature also gives you the option to allow stream tracks from last.fm (this requires either a subscription or living in a country that the last.fm radio feature is free). You are allowed to choose the frequency of the last.fm track streaming. You also can choose either to stream tracks from artists similar to the current track in the playlist, either tracks recommended by Last.fm, or tracks belonging to specific tag/artist radio station etc. I think it is a really nice feature, and I am gonna use it a lot from now on, because it gives another feeling to the music listening and the reason is that I rarely listen to random tracks, most of the times I listen to full albums. Lately I have been trying to manually manage my 6G 160GB iPod classic, in the past through Winamp with the default iPod plugin, lately I moved to MusicBee (it also supports iPod management, but I think it needs some work more, Winamp’s iPod management seemed smoother with less issues), which I believe is a wonderful player, and has also build in last.fm support, a feature that is important for me. Well it has a few issues with the last.fm tag radio stations but still I don’t have to have the extra of the last.fm player. For some time now I prefer the use of Notepad++ instead of the Windows default notepad, so lately I decided that I wanted to replace the default notepad with notepad++. With some searching on Google I found a way to do it. There is a link to the original article at the end of the post. Then you have to get Notepad++ from it’s official website: http://notepad-plus.sourceforge.net/ and install it. rem PLEASE MAKE SURE THAT USER ACCOUNT CONTROL (UAC) IS TURNED OFF AND PC HAS BEEN REBOOTED FIRST! rem If you are using VISTA x32 version, then edit this file first by adding “rem ” in front of every line that contains the phrase “syswow64?. Then run the script again. Then you have to save the batch script and execute it. The script backups the original notepad just in case. The source for this guide is the following article: Replace Notepad in Windows 7. The original article was for replacing notepad with notepad2 but it can also work for notepad++ as described above.